This post originally appeared on Lee and Associates Orange Blog and is republished with permission. Find out how to syndicate your content with theBrokerList. 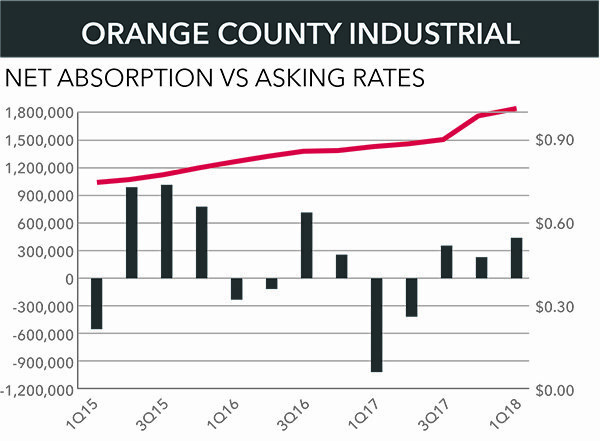 With the countywide average vacancy rate falling to 2.4% in the first quarter, available industrial space has never been in shorter supply. In the North County market, the first-quarter vacancy rate fell to 1.5%. Of the county’s 8,310 industrial buildings totaling 276.9 million sq. ft., about 200 are vacant and an additional 250 are listed as available. Few buildings offer well-located, quality options for growth-minded companies. Much of the available space is functionally obsolete and unsuitable for most users. Asking rents across the county continued climbing in Q1 with year-over-year net increases averaging 10.2% for direct-marketed space. Lease rates spiked 18% in North County year over year after gains averaged 4.7% over the previous three years. Countywide net absorption was mixed, totaling 407,615 sq. ft. in the first quarter. It was the third straight quarterly improvement, driven largely by strong demand across eight cities in north Orange County. On the other side of the ledger is the 73.2 million sq. ft. Airport market – the county’s second largest—where tenants have shed nearly 1.3 million sq. ft. since 2016. With 116.9 million sq. ft., North County – the county’s largest market with 42% of the base inventory – posted its fifth straight quarterly increase. Year-over-year net absorption totaled 1,296,295 sq. ft. and has been positive in 16 of the last 20 quarters with a quarterly average of 235,000 sq. ft.
More than 415,000 sq. ft. came off of North County’s available inventory in Q1. There were five leases in North County totaling 374,247 sq. ft., led by Walt Disney Company’s agreement for a 200,000 sq. ft. building in on East Cerritos Avenue in Anaheim. Since virtually no land is available anywhere in the county for development other than a handful of scattered infill sites, the prospect of any significant future new supply is effectively off the table. The county’s industrial inventory is substantially unchanged since 2010 as the number of new buildings is essentially equal to the number razed for residential and retail development. West County’s asking rents jumped 12.3% year over year after gaining less than 20% over the prior 16 quarters. With 44,737,727 sq. ft., Q1’s 2.9% vacancy rate was unchanged from year-end 2017 but up 0.9% year over year across West County’s cities of Cypress, Huntington Beach, Westminster, Stanton, Los Alamitos and Seal Beach. The vacancy rate in South County – the county’s smallest market with 41.9 sq. ft. – ticked downward 10 basis points from Q4, settling at 2.9%. Net absorption totaled 32,906 sq. ft. First-quarter lease rates were up 4.3% year over year. The Orange County Office Market Report is published quarterly by the Lee & Associates’ Irvine, Newport Beach and Orange offices. ©2018 Lee & Associates, Inc.
Lee & Associates Orange provides the commercial real estate user, owner and developer with real solutions to their business and operational space requirements. We have earned a reputation for high ethical standards, a service-first approach and superior market knowledge. Lee Orange has 45 plus professionals practiced in selling and leasing of industrial, office, flex, retail, land, medical and research & development properties. Since 1983, we have assisted clients throughout Southern California with a focus on Orange County, Western Riverside County and the Mid-Counties area of Los Angeles. Follow Lee & Associates Orange company page on Linkedin here. Are YOU an Arbitrary Commercial Real Estate Owner? Signing a Lease Creates Wealth: It can be true.